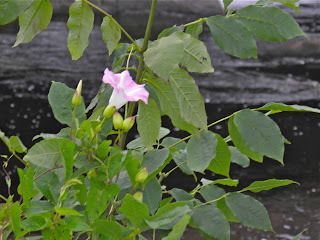 Devoid Of Culture And Indifferent To The Arts: Wildflowers: Morning Glories! 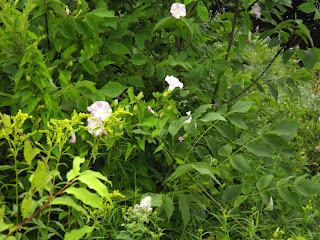 Beautiful, if transient, river bank blooms. Recently I was back at the village where I grew up and, as usual when we’re visiting, Henry (my Bouvier) and I took a walk up to the local beach. The beach is located a short distance from the head of the river that the village straddles. Scrambling up a sapling on the river bank. On the way back along the river I couldn’t help but notice how much mother nature gives to us in the late days of July. Naturalized day lilies lining both sides of the river, the last flush of the wild roses, Queen Anne’s lace, musk mallows of various forms, and morning glories, to name just a few. And how glorious they were. In some places they were scrambling up bushes on the river bank to a height of at least 7-8 feet. The time was quite early and the blossoms had just opened for their daily display so they were in peak form. 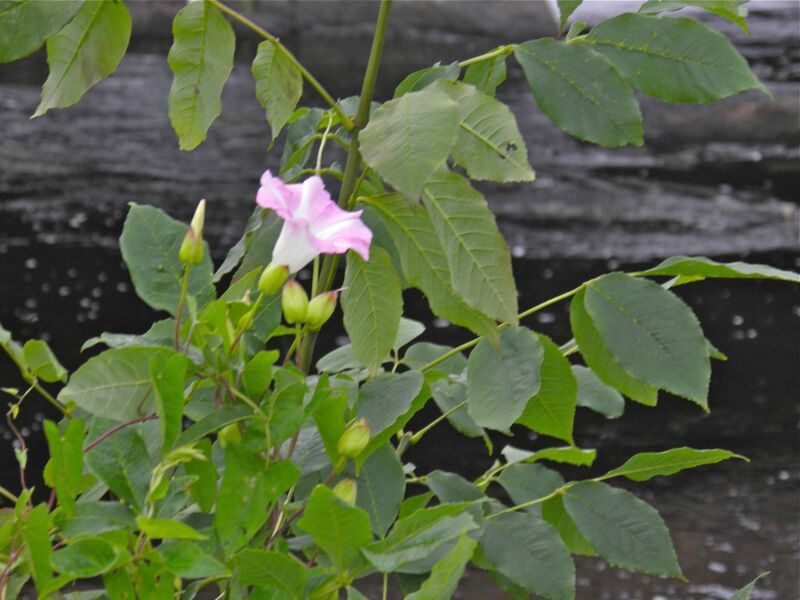 Morning glories require full sun, and as the name suggests, the blooms begin to fade in the very early afternoon. Each blossom only has a lifespan of about 1/2 day, to subsequently be followed by another boom the next morning. 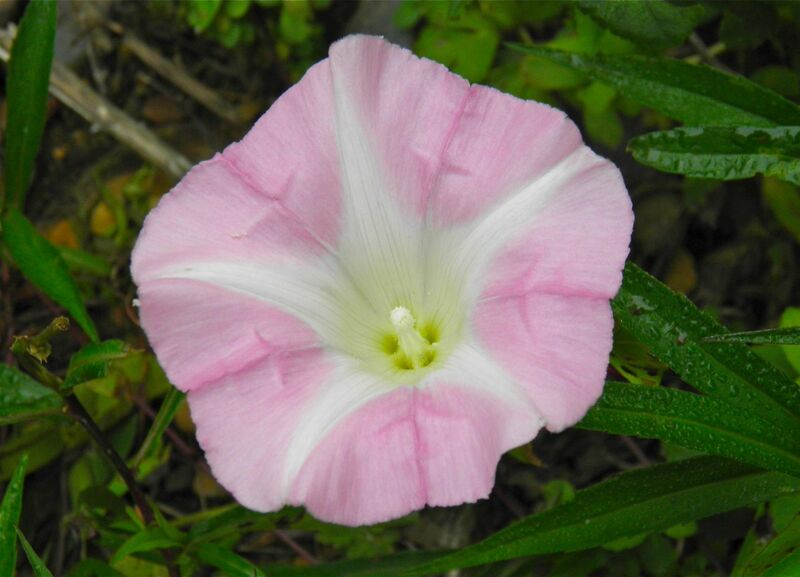 I’m not exactly sure what kind of morning glory we have here, as the family Convolvulaceae has at least 1,000 species. Morning glories are common world wide and I’m sure there is probably only one or two “wild” species in Nova Scotia. Several vines can put on quite an unexpected display. At various times we have purchased and planted morning glory seeds, usually in blues, whites and pinks. It’s easy to read a seed packet and know what you’re dealing with. Those varieties are treated as annuals in our Zone 5-6 climate. I do not know if they were originally hardy escapees from old homestead gardens, or if they are actually a native to our area. Trying to find out a name would be a fool’s errand as the flower family is so vast and they all look very similar. Regardless of their real name, they were a wonderful sight as I began my morning. Last year, wild morning glories established themselves at the side of my house (probably courtesy of a customer at my bird feeder). My grandparents had these and I always wanted them. They're VERY prolific! They die off with frost, but they reseed themselves. This year, I bought them two trellises. They've already covered those trellises with thick vines, gone up my drainspout, covered the bird feeder hanger, and are starting to move horizontally along the side of the house. They're just covered with beautiful bluish-purple flowers! I understand they're considered a weed. Great! Nothing but weeds will grow at the side of my house anyhow. It's all wild yarrow, which is about as noxious a weed as it gets. Next year, I will save the seed pods, cut the yarrow down to ground level, and throw the morning glory seeds all over the place. Hopefully it'll choke out that yarrow. I have tall ravenna grass at the front corner of the house. I'm picturing that stuff covered with morning glory flowers!